by Staff Writer Kaia M.
The Maximum is an organisation which takes the dung from adopted elephants from the “Millennium Elephant Foundation” near Kegalle in Sri Lanka and makes it into colourful paper. It started with just seven employees producing paper from a small factory on site. It did not take long however to realize that the six elephants resident at the millennium were a living, walking natural material source. They soon established that elephant dung was a perfect material to produce paper. Hence the introduction of their signature “Elephant Dung” paper range. Since then, the factory at Kegalle has been expanded to handle the increased production. 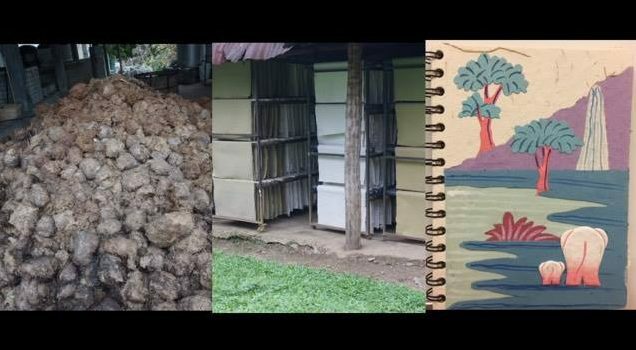 What started as a small production developed into something bigger and greater and now they are able to vary colour, texture and thickness to suit individual needs by adding, for example: – rice paddy straw, cinnamon and banana bark to add smell and colour. Joseph, a worker at Maximus now gives 15 minute tours to tourists, where he explains in depth the process of making the dung paper. There are 8 fundamental steps to making dung paper he says, most in which are done by hand and all are done without any kind of chemicals. Other waste paper is then added to the dung fibres and the mixture is pulped. Joseph ends his tour by showing the tourists the beautiful gift shop, stocked with all kinds of books with all kinds of designs successfully showing the people a new way of not only creating paper but sustainably creating it . After all the work the past, present and future workers put in, the aim of Maximus will always be to use the “Elephant Dung” paper to create a something sustainable and then further raise awareness to the tragic circumstances that surround the Sri Lankan Elephant.